The word “Dressage” does not connote a specific costume for riding, nor does it describe a particular type of horse to be used. Rather the word simply means…training, or more specifically, the discipline of training. In this definition you could “Dressage” your dog, or we could have bovine “Dressage”! (I can see the movie now…The Cow Whisperer, or Dances with Cows!) For thousands of years the Native Americans, European, Mongolian, and Arab counties have been intensely studying and training horses. In the process they have developed a set of training programs or levels that ultimately help to develop both horse and rider gymnastically and for specific jobs. In our “Western” costume, or our “Endurance” costume, we need to take on the work-ethic of our cultural friends, and learn from the training programs they have developed over time. 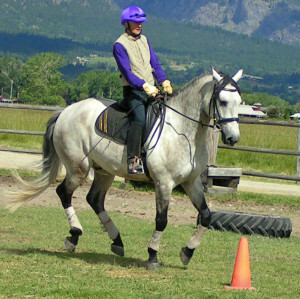 Conditioning the horse in self-carriage, being vigilant of our posture, developing the horse according to his muscle and mental progression are but a few of the characteristics we all could learn from the discipline of “Dressage”.